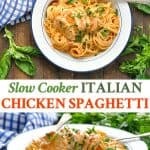 With just 5 minutes of prep, this Slow Cooker Italian Chicken Spaghetti is an easy dinner recipe that the kids will love! 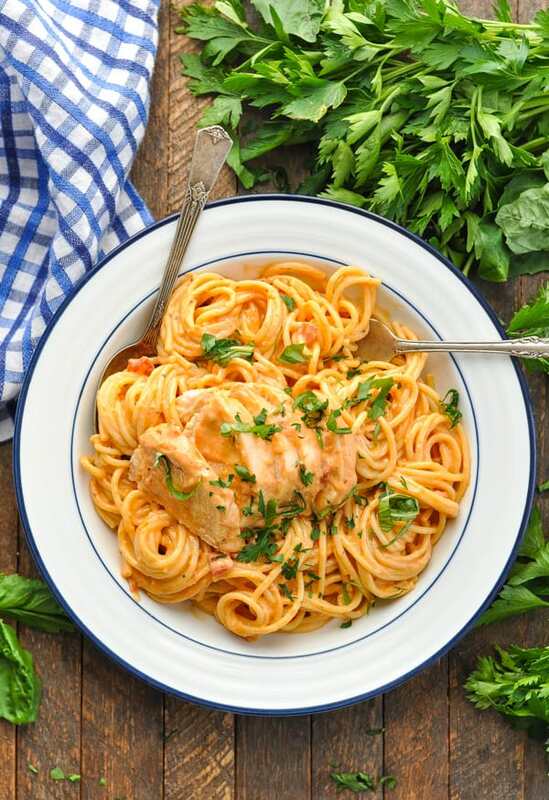 With just 5 minutes of prep, this Slow Cooker Italian Chicken Spaghetti is an easy dinner recipe that the kids will love! 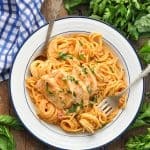 Made with red sauce, plenty of zesty seasoning and smooth cream cheese, it’s a family-friendly Crock Pot meal that satisfies even your pickiest pasta lovers! Trust me, y’all. This Chicken Spaghetti recipe is about to become your new go-to weeknight dinner. It’s so simple, so full of flavor, and so darn gooooood! First, let’s start with the Chicken Spaghetti ingredients! You’ll need about 2 lbs. of boneless, skinless chicken breasts (or thighs) and 2 packets of Italian dressing mix. Don’t prepare the salad dressing — you only need the dry seasoning! Place the chicken in a slow cooker and sprinkle the dressing mix over top. 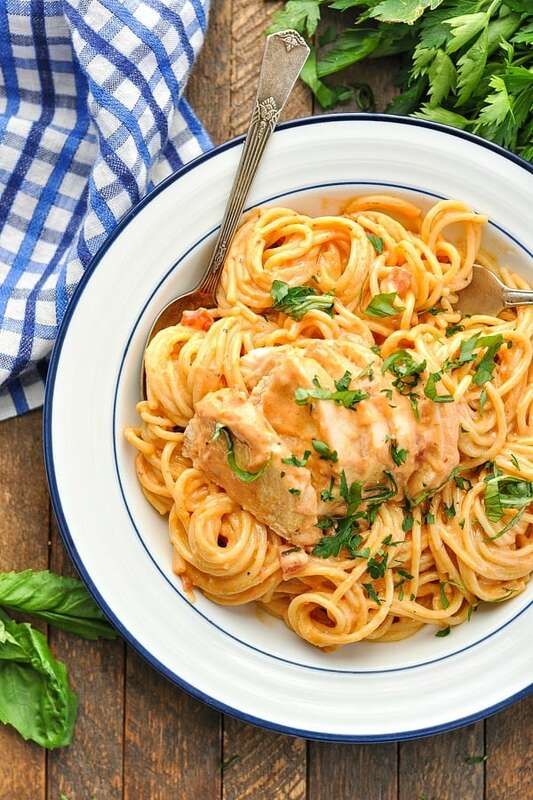 Since this is a Chicken Spaghetti with Red Sauce (or Tomato Sauce), you’ll also stir together the following ingredients: 1 can condensed cream of chicken soup, 1 can petite diced tomatoes, and 1 1/2 cups marinara sauce. Pour the sauce over the chicken, cover the pot, and cook on LOW for 6-8 hours or on HIGH for 2-3 hours. When the chicken is cooked through, remove it to a cutting board. While the chicken rests, stir 1 block of cubed cream cheese into the sauce. Cover the pot, cook for about 5-10 more minutes, or just until the cream cheese is melted and the sauce is creamy. Slice or shred the chicken, return the meat to the slow cooker, and your sauce is ready to serve! 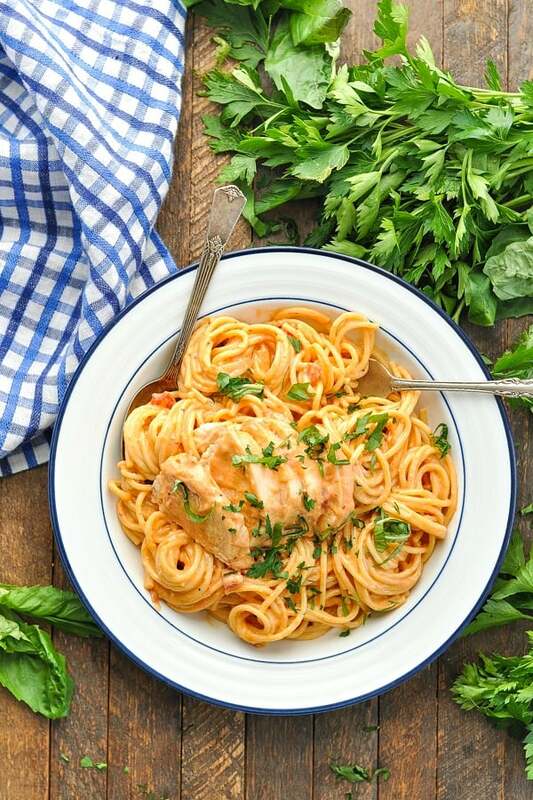 Toss the chicken and sauce with cooked spaghetti, garnish with Parmesan and herbs, and your family will be in pasta heaven! I do NOT recommend freezing the leftover chicken spaghetti. It’s best served warm — right after it’s made! 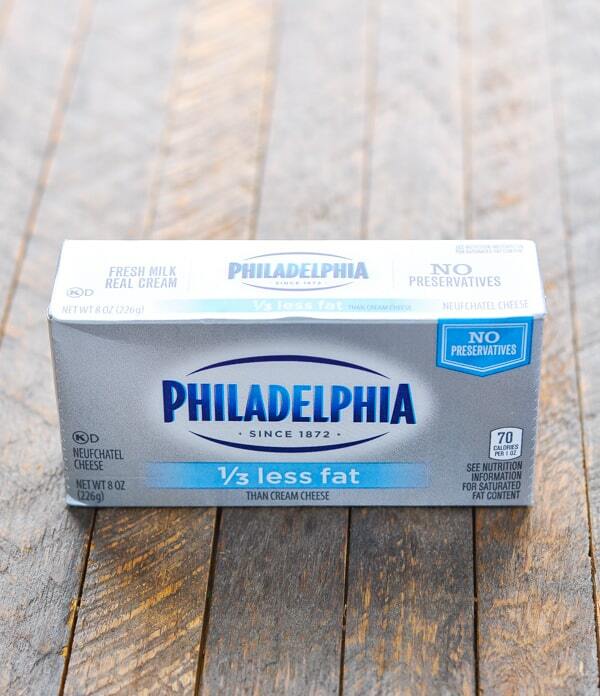 Cream cheese has a tendency to “break” when it’s frozen and defrosted, so you would end up with chunks of cream cheese in your thawed sauce (not appetizing)! Be careful not to overcook your chicken breasts. 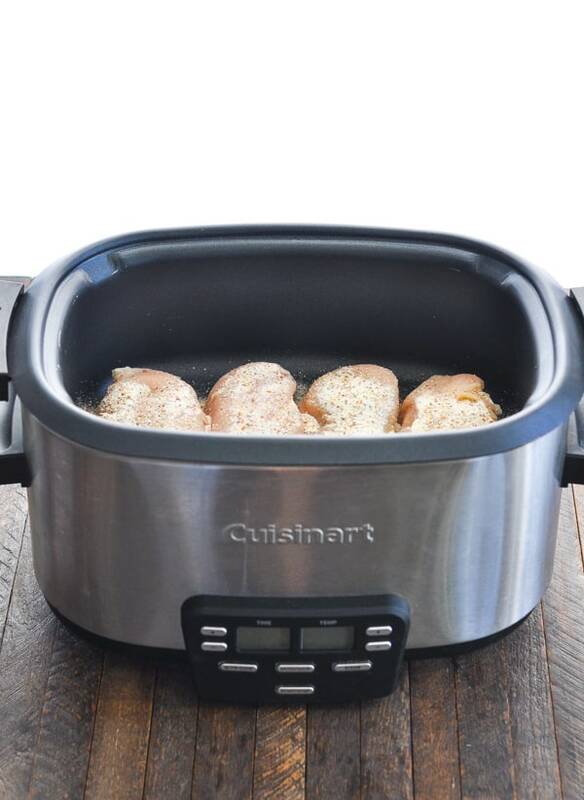 I find that the chicken breasts have the best texture when cooked in my slow cooker on HIGH for about 2 hours. That keeps them moist and juicy, and prevents them from drying out. If you would like a dish with a longer cooking time, try using 2.5 lbs. of boneless, skinless chicken thighs instead of the breasts. The thighs tend to stay juicy when left in a Crock Pot for extended periods. 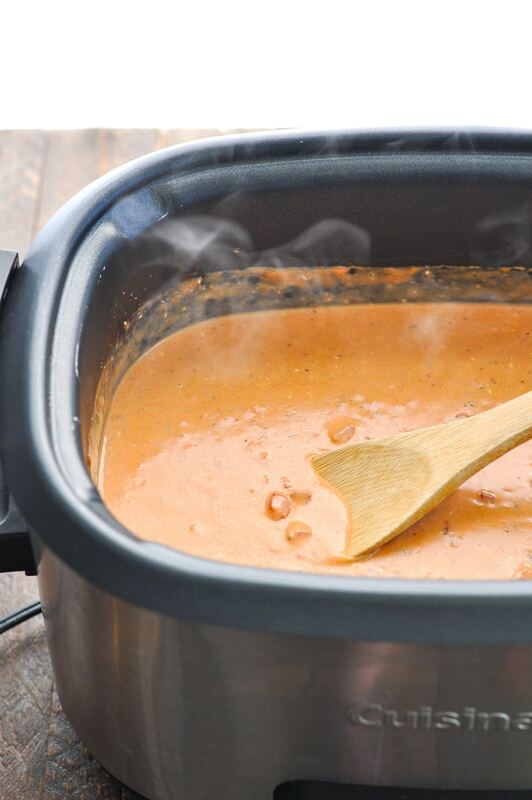 Also remember — every slow cooker runs at a slightly different temperature (which is why the recipe gives you general time ranges, rather than exact times). Since my slow cooker tends to cook at a relatively high temperature, I find that the meal is best when cooked on HIGH for about 2 hours or on LOW for about 5 hours. Just get familiar with your pot and adjust accordingly. Wait to add the cream cheese to the sauce until the end of the cooking time. If you add the cream cheese at the beginning, it will separate and curdle. For a lighter meal, try serving the creamy chicken spaghetti sauce over zucchini noodles or cauliflower rice instead of the cooked spaghetti. Spray inside of slow cooker with cooking spray. Place chicken in slow cooker and sprinkle with dry Italian dressing mix. 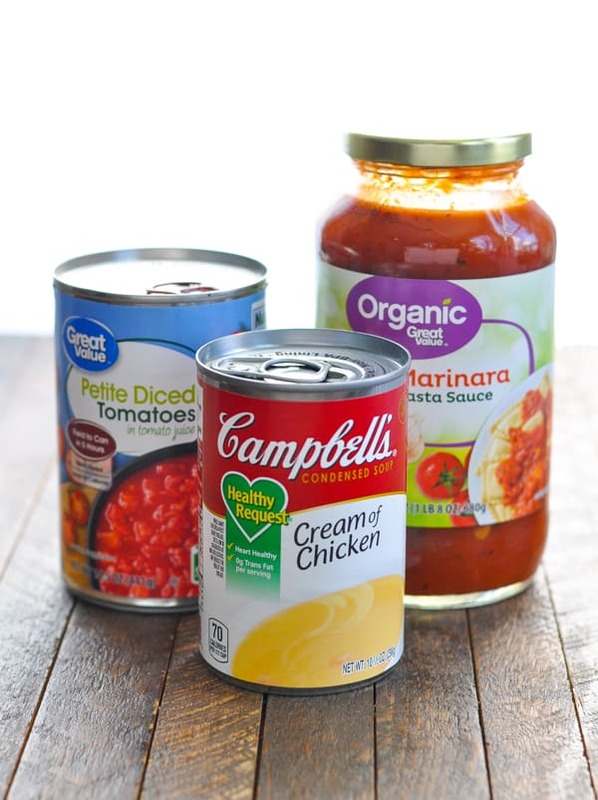 In a large bowl, combine condensed soup, diced tomatoes, and marinara. Pour sauce over chicken. Cook on LOW for about 6-8 hours, or on HIGH for about 2-3 hours. 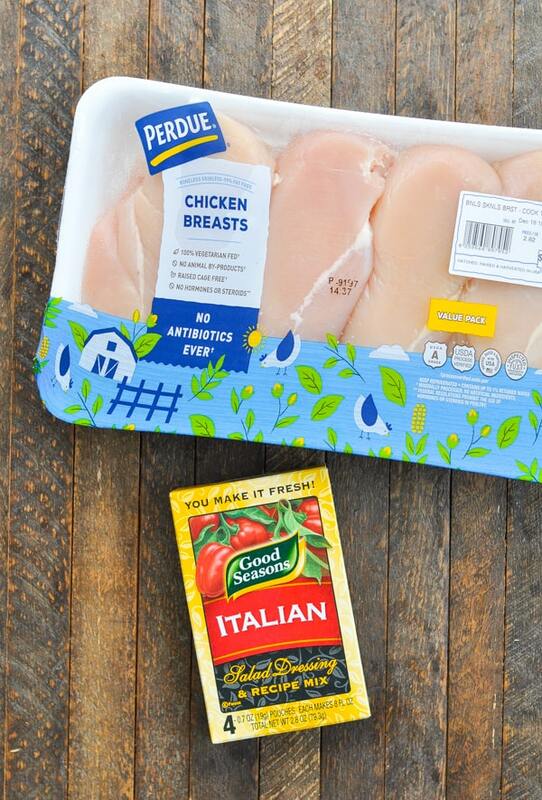 Remove chicken to a cutting board and cover loosely with foil to keep warm. While the chicken rests on the cutting board, add the cream cheese to the slow cooker, stir and cover. Continue cooking the sauce for 5-10 more minutes, or until cream cheese is melted and completely combined in the sauce. Slice chicken or shred with two forks. 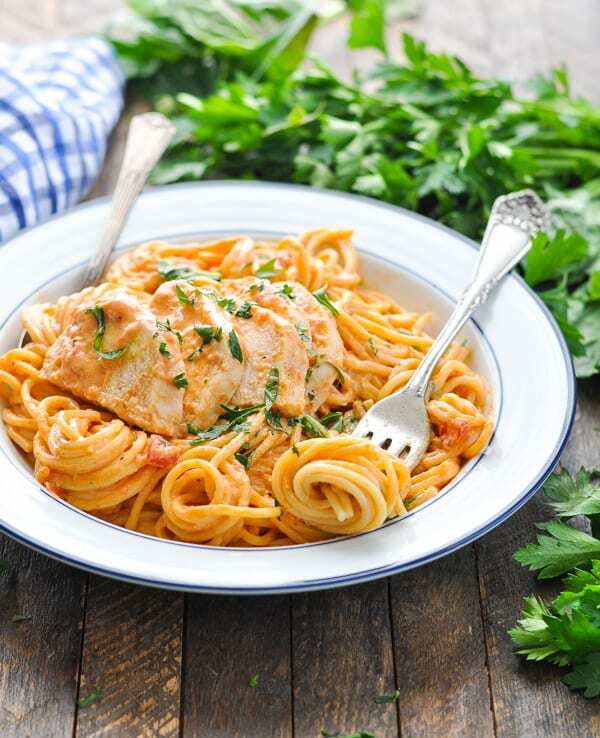 Return chicken to the creamy sauce, stir, and serve over cooked spaghetti. Garnish with grated Parmesan and fresh herbs, if desired. Nutrition Information is an estimate using online calculators for 1/8 of the chicken and sauce. This does not include any pasta or garnish that you also enjoy. 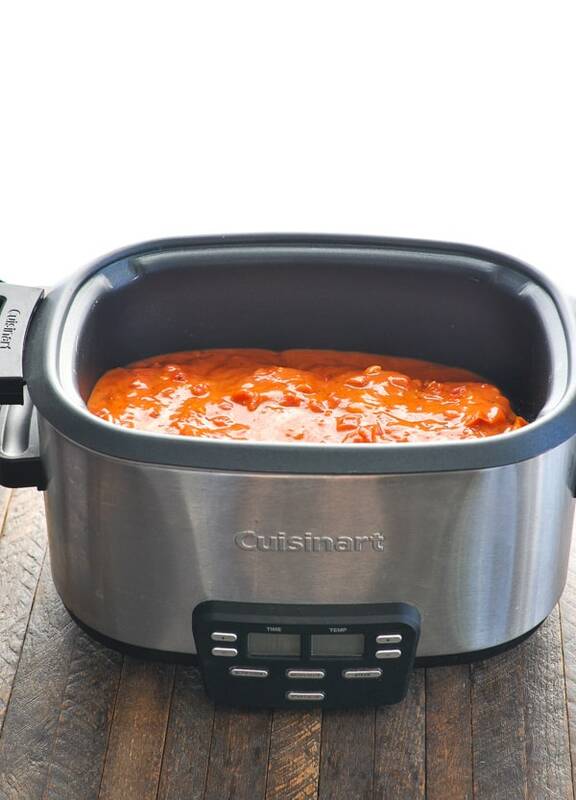 Also remember -- every slow cooker runs at a slightly different temperature (which is why the recipe gives you general time ranges, rather than exact times). Since my slow cooker tends to cook at a relatively high temperature, I find that the meal is best when cooked on HIGH for about 2 hours or on LOW for about 5 hours. Just get familiar with your pot and adjust accordingly. I do NOT recommend freezing the leftover chicken spaghetti. It's best served warm -- right after it's made! Cream cheese has a tendency to "break" when it's frozen and defrosted, so you would end up with chunks of cream cheese in your thawed sauce (not appetizing)! This recipe was originally published in April, 2013. It was updated in January, 2019. My wife and I love pasta!! We love trying out new recipes. I just texted her this link, I’m excited to give this recipe a try, thank you!